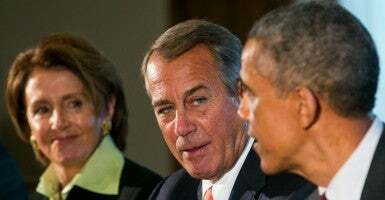 House minority leader Nancy Pelosi, D-Calif.; House speaker John Boehner, R-Ohio; and President Obama in January. 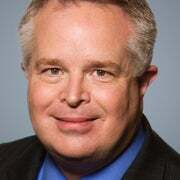 The debate over the Trade Promotion Authority (TPA) bill backed by President Obama, House Speaker John Boehner and Senate Majority Leader Mitch McConnell has turned into a debate over just about anything except free trade. The easy interpretation is that if you’re pro-TPA you are pro-trade, and if you’re anti-TPA you are anti-trade. But the bill also has components that should concern free trade advocates. It directs trade negotiators to preserve destructive U.S. antidumping laws instead of working to reduce other countries’ antidumping laws, and calls for countries to adhere to international environmental and labor agreements of dubious value. It expresses concern about currency manipulation, a protectionist standby. There are also non-trade-related parts of the bill that should alarm conservatives. It urges respect for “internationally recognized human rights,” which for the United Nations and most countries includes international covenants like the Convention on the Rights of the Child and the Convention on the Elimination of All Forms of Discrimination against Women, neither of which has been ratified by the United States. Contrary to some critics, support for TPA does not have anything to do with support for Obama’s position on amnesty or Obamacare. Although TPA allows Congress to spell out negotiating objectives, the amount of leeway it gives the president means that who the president is matters. And a president who has pledged to negotiate “the most progressive trade deal the world has ever seen” is clearly interested in ensuring that new deals advance major parts of his progressive agenda, including new multinational labor and environmental regulations and the injection of minimum wage guidelines into trade agreements for the first time in U.S. history. Some of TPA’s most outspoken opponents, particularly from the left, rely on protectionist rhetoric, but it is possible to question the TPA process without questioning the benefits of trade. Whether or not they support TPA, that’s an agenda on which all conservatives could agree.